I along with thousands of others seem to be immediately hooked. I’d probably go as far as saying we are addicted to Doolally. Who can blame u? It’s located in a nice quite street in Bandra, it’s very casual, always has a buzz, the beer is truly unbelievable, the grub is good and the price offers incredible value for money. Rs 250 for 330ml glass of world class beer just feels so right. Since it opened I find myself dreaming about their beers and land up visiting on average of at least thrice a week. Sometimes it’s just for 2 quick pints. Sometimes it’s just because I’ve got off the sea link on my way home in the evening . I’ve even got one of the member mugs with my name on it. The beer is undoubtedly the star of the show, with a variety of offerings and each of them with their own unique flavors, they keep you coming back for more. My favourite would have to be the Stout, though their Hefeweizen, Belgium wit beer, Belgium Farmhouse ale and their Weizenbock are excellent. There are more and I like them all frankly. Haven’t tried their cider and don’t intend to but it does seem popular as well. To get the uninitiated up to speed they are happy to pour tasting portions so that people can sample and then place an order. 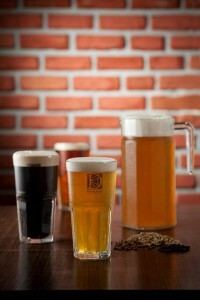 They and the other brewpubs like The White Owl along with Gateway Brewing have upped the quality levels of beer available in Mumbai so dramatically that I think Kingifsher and the like will have to change their game if they want to retain quality oriented consumers. The food though not the centre of attraction is actually very good and also different which makes it interesting. Scotch eggs, Kerala prawns, ghee chicken roast, the batter fried bombay duck all really good and all perfect to go with their beers. No one can deny that there is a drink revolution going on in India, Doolally gives us an opportunity to drink world class delicious beer and not the crap that we’ve been subjected to all this while at prices that are affordable. Well at least since before Gateway came along. At Doolally suddenly conversations about different kinds of beer and understanding their origins can be heard from every table and that’s something right ? Even though we’ve been drinking beer all this while we never really bothered to know the differences until now. But Doolally has created another revolution, one that I have been watching closely. The revolution I’m talking about is the social revolution when it comes to drinking that Doolally seems to have set a tone for. I find that people are comfortable getting their kids ( very young kids as well) and even their pets to Doolally. Doolally has somehow created a vibe that is very welcoming, almost like a German beer garden. It’s this sort of vibe, openness to drinking a glass of beer that India needs. Going out for food and a couple of pints of beer if handled responsibly could also be a family affair. Nowhere else do I see this phenomenon. It’s changing things, you see some people wondering ( My wife and I go with our twins every sunday) what we’re doing but then I also see them changing their stance when they see us having a good time. The kids freak out on the fries and we sip on a beer or two and spend our time together. Really nothing wrong with that.